Choosing a homestay, also known as a bed and breakfast, can be a good idea, especially for those who are new to the city and appreciate the reassuring presence of a host. As homestays only have a few guest rooms in a residence, service is intimate and personalized, and the hosts usually go overboard to please and offer invaluable advice. In addition, guests are served delicious home cooking and get to experience the Indian way of living. These popular Delhi homestays for all budgets are delightful alternatives to hotels in Delhi. Most are located in quiet, modern residential areas in south Delhi. 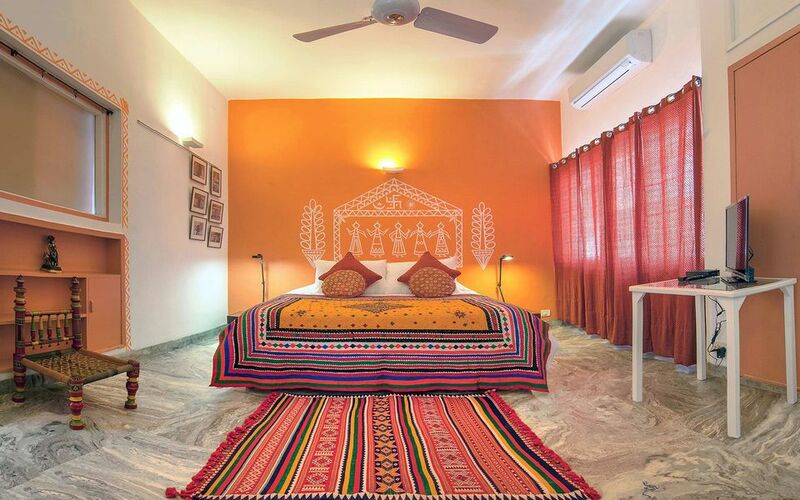 This gorgeous boutique bed and breakfast was formerly known as Amarya Haveli. Now under new management, it's run by a heritage aficionado and her photographer husband, who have even written books about Indian heritage and travel. The property is a heritage bungalow that's been done up with heritage as the main theme. It will have huge appeal to art lovers as it's filled with interesting pictures, lithographs, canvases, carved wood, traditional textiles and hand-woven rugs. The five stunning guest rooms also have individual heritage themes from different states in India. Delhi's hip Hauz Khas Village, with its cosmopolitan shops and restaurants, is only three blocks away! Located in the leafy upmarket in south Delhi neighborhood of Gulmohar Park next to Hauz Khas Village, Thikana means "the place to which you belong" in Hindi. This peaceful bed and breakfast has five recently renovated rooms, two separate sitting areas with sofas, TV and computer desk, plenty of books to choose from, wireless Internet, and rooftop garden. Beautifully decorated with artifacts and works of art, it's popular with longer staying corporate guests as well as tourists. The hosts are a delightful young couple who love entertaining guests and are into all kinds of music. Note that there are no TVs in the rooms, although you'll find one in the sitting area. A tasty European breakfast is served. Bed and Breakfast at Eleven is set in a colonial bungalow that's very well located in a quiet area of south Delhi's upscale Nizamuddin East Colony, a residential neighborhood that's home to many intellectuals and journalists. It's just across the road from Khan Khanna's Tomb and is within walking distance of Humayun's Tomb. The property has four large and well-equipped guest rooms, located at the rear with their own entrance. The likable host makes a big effort to ensure guests feel comfortable. Hearty breakfasts are cooked to order. Also situated in Nizamuddin East Colony, stylish B Nineteen would best be described as a luxury bed and breakfast, although it could pass for a boutique hotel. The building, which its architect owners also live in, was completely remodeled by them in 2006. There are six contemporary guest rooms spread over two levels. An in-house cook prepares delicious dishes from a small but diverse menu, or guests can make their own meals if they prefer. However, what really stands out are the views across to nearby Humayun's Tomb. The monument is illuminated at night and it creates a magical atmosphere. If you're in the mood for romance, don't miss a candlelight dinner on the rooftop with it as your backdrop. What makes the tranquil Tree of Life unique is its wellness focus. One of the hosts practices and teaches yoga and foot reflexology -- perfect for tired and stressed travelers! The other owns a reputable car rental company and is very helpful with making travel arrangements (including booking train tickets) and providing sightseeing advice. There's also a terrace with a superb view of Qutub Minar, and a DVD and book library. All in all, this bed and breakfast is a haven for relaxation. You'll feel very well taken care of. When you do want to venture out, there's a Metro train station only five minutes walk away! A very popular south Delhi bed and breakfast, Saket Bed & Breakfast has tastefully decorated, newly refurbished rooms with bathrooms that have fully screened showers (a rarity in India), a leafy outlook, and plenty of natural light. The emphasis is on cleanliness, efficient and personalized service, and boutique amenities. Many of the guests are regulars who keep coming back, and it's particularly favored by single female travelers. Hauz Khas village, Qutub Minar, restaurants and shops are all minutes away. If you love to sleep in, you'll be pleased to know that breakfast is served until noon! This lovely bed and breakfast gets its name from the host's father, a Colonel in the Indian Army. Due to his postings all over India, the family is very well traveled. The property has three immaculate guest rooms, plus balconies and rooftop to relax on. Its location, not far from ​the Defence Colony market, has many gourmet restaurants. Alternatively, all meals can be prepared in-house upon request. The cooking classes held by the host's mother (the Colonel's wife) and her team are a highlight. Guests also rave about the home-made banana bread and gooseberry jam. G 49 Bed and Breakfast has a serene setting, surrounded by trees, that's best appreciated from one of the rooms with a balcony. The six guest rooms are spacious and decorated with splashes of bright color, and there are plenty of books around to read. Service is efficient and the host is jovial. G 49 is located five minutes away from Humayun Tomb, Nizamuddin Mosque, and Lodi Gardens. The only drawback is that it's not near a Metro train station, although auto rickshaws are easy to get. Pervez and Lubna's characterful three-story home has been warmly welcoming travelers, and providing them with authentic and interactive Indian experiences, for many years. It has been built in traditional style, with living spaces around a central courtyard. There's one guest room on each floor and plenty of outdoor areas for relaxing, whether in a hammock in the garden or on the terrace. The hosts are very knowledgeable and go out of their way to help guests, including making travel arrangements, attending cultural events, or even giving a cooking class. You'll really feel like one of the family at their place. If you're visiting India for the first time and are hesitant about what to expect, this homestay will be the ideal start to your trip! If you want to stay right in the midst of the action of Hauz Khas Village, The Lazy Patio is the place! It may come as a surprise to find a bed and breakfast in Hauz Khas Village, which is better known as being a food and beverage destination. However, that's because The Lazy Patio was once Boheme Cafe, the most popular rooftop restaurant in the Village! It received a makeover and now offers three massive guest rooms, the best of which has glass walls and panoramic views. Every room has a terrace or patio. There's also a shared kitchen for guests to use. Book well in advance because, not surprisingly, it sells out fast! If you want to stay in a convenient central location in Delhi, family-run Master Bed and Breakfast is a calm oasis that's only a few kilometers from Connaught Place and New Delhi Railway Station. The hosts provide expert advice about the city and arrange informative Delhi sightseeing tours, including one of "Hidden Delhi". They're also a wealth of knowledge about alternative medicine, yoga, spirituality and Indian culture. It's worth paying extra for the rooms on the top floor as they have a fabulous private patio area. Grace Home is the perfect choice if you're looking for a budget homestay without sacrificing comfort. There's a terrace garden with wonderful views and a bicycle to ride for free. Food is excellent, rooms are kept spotlessly clean and even have air conditioning. It's run by a friendly and well-traveled professional family of three -- an engineer, doctor, and school teacher. They'll make you feel very welcome while still respecting your privacy. What Are Delhi, India's Best Tours for Travelers New to the Territory?